Rain, rain, rain. We’ve had 3.5 inches in the last two weeks and it would be alright with us if they turn the tap off for a bit. Hallelujah for the “Big Tops”, the tomatoes still look great as well as Betsy’s lisianthus and the staff can still work even if it rains (of course if they are like us they are looking for a day off). The fairly continuous rain at market on Saturday once again made us think about how great our customers are, coming out and supporting us and the other vendors at market even in the rain. It also makes us think about how basing our business around outdoor Farmers’ Markets is at the whim of the weather and other factors beyond our control. We consciously have moved more of our business towards the markets over the past few years for several reasons, first we just love to be at market, to see everyone and hear what you all think about the products that we sell. Second it fits with our scale of production, when we were more in wholesale we had to keep growing more to meet their needs, it was never enough. Third it is better income than wholesale because we can sell for closer to a retail price. On the other hand the market life can be relentless with no way to overcome days with bad weather or other problems, we can’t just take the stuff home and bring it back next week, that’s why they are called perishables. I explain to the staff and others, including family members, that 75 percent of our business is done at the Farmers’ Markets and so Saturday, in particular, is not to be trifled with. No weddings, no family reunions, no extracurricular activities on Friday or Saturday morning during market season. We have about 100 hours a year to make our living, we don’t mess around with that. So when the forecast is for rain it makes us pause, then we are always pleasantly surprised when the customers come out. Thank you again. Despite the rains we have a fairly busy week going on. 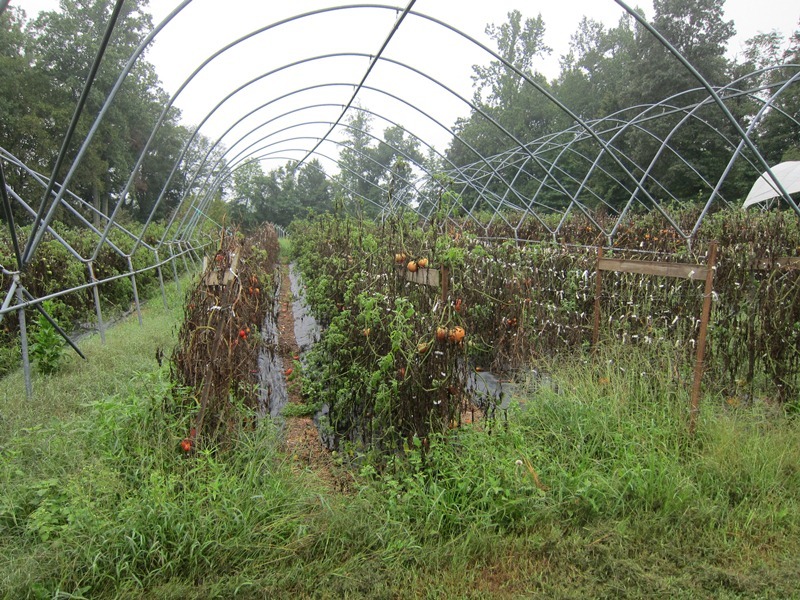 Several groups touring the farm including the graduate students in floriculture from NC State and the student interns from the Center For Environmental Farming Systems in Goldsboro. We host them every summer during their intensive week on Soils. They come to see how we manage our soils sustainably and to see how a small farm can be profitable. These groups always ask good questions that make us think about why we do things the way we do, I think that its always good to look in the mirror from time to time. 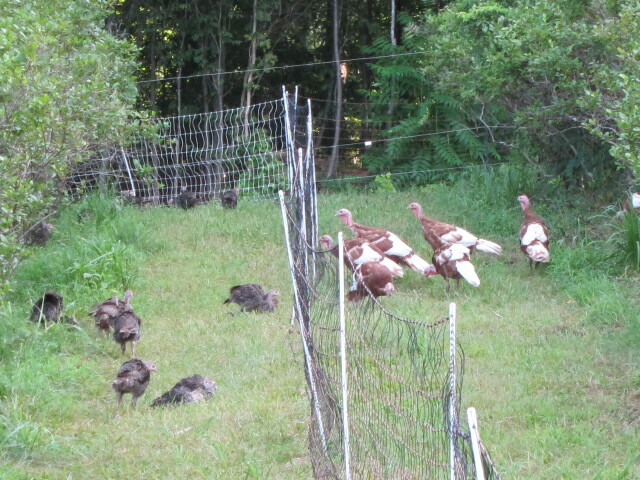 The next 40 turkeys arrive this week as well. We get them in two batches because the Heritage birds take at least 26 weeks to get to size but the Broad Breasted birds grow so fast that they only need about 18 weeks to get huge. We are hoping that we won’t have any 30 pounders like last year by getting this group later. The Heritage birds are getting big and have moved to their next location, maybe a picture next week. Tonight (Wednesday) is Panzanella’s Local Food dinner with part of the proceeds going to support the Carolina Farm Stewardship Association. Look for our tomatoes on the menu and the flowers that Betsy donated to spruce up the festivities. Go and eat great food made from local products and support our local sustainable farming non-profit! Despite the rains look at how beautiful the Lisianthus and Celosias look! This has been one of those weeks when people begin to ask “when do you have time to farm?” as I go from one meeting to another. I have to admit that I have not spent as much time in the field this summer as I usually do. Mostly due to the on going wrangling at the poultry plant and the Growers’ Choice Cooperative I have been running around central North Carolina a lot. We knew heading into this season that this was going to be the case but felt that we could handle it this year because our staff is so good. It has been! We are extremely fortunate to have a group of people who have been with us for several years and begin to know the system as well as we do. We joke that Joann understands my handwriting and speech patterns better than Betsy does! When I scrawl the restaurant orders down, with my own abbreviations, Betsy will show it to Joann who knows exactly what it says. Most mornings now, as they arrive at the farm, we sit under the little shed we use to store straw in and go over that days jobs. I usually can say we need to do X,Y and Z and they head off to spend their mornings without me at their side. 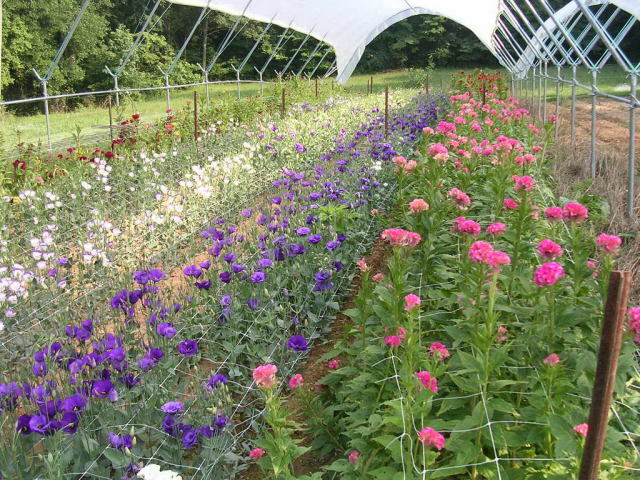 Picking tomatoes, trellising flowers, weeding Lisianthus they now know how to do it as if it were their own farms. 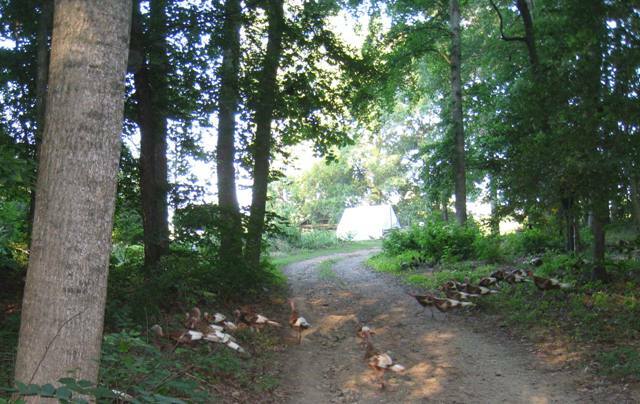 Of course Joann has her own farm, Castlemaine, and Rett has just left us to move to his new farm in the mountains. Will is starting a new farm down in Chatham county and Rachel is in her third year working on local farms after her boyfriend Lee worked for us before that. We have always tried to create a working situation here where, as they learned the system, we let them operate it without excess supervision. Just enough to make sure the quality and efficiency is there but not so much that they feel micro managed. Generally we have managed to successfully hit that balance, sometimes we miss the mark but never with disastrous results. It is difficult in our situation in that we can’t have permanent, year round help. Because we are seasonal we have to make the job as enticing and rewarding as possible and become efficient and effective teachers so that they can get up to speed quickly without the frustrations that can come with learning something new. We have been very lucky with staff for many years and this year they have made it possible for me to be distracted by off farm projects, I can’t thank them enough. It is a little eerie when you go to deliver produce and there are life size posters of you by the door. Tomorrow night (Thursday) Panzanella restaurant and Weaver Street Market are having another of their local Farm Dinners this one featuring us! 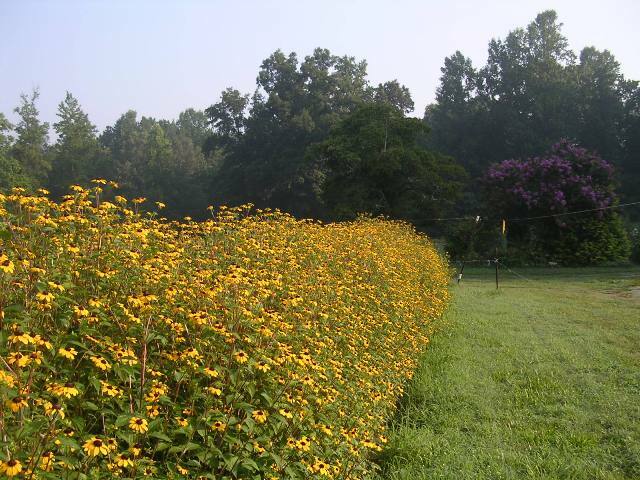 This one will benefit the Sustainable Farming Program at Central Carolina Community College in Pittsboro, five percent of the proceeds will be donated. 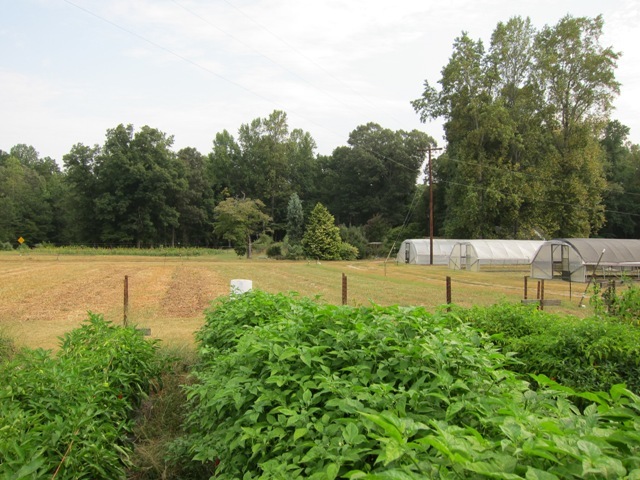 This is where I taught the Sustainable Vegetable Production class for six years and many of our excellent staff have taken classes there. The format is they have a number of special dishes made from the featured farms produce along with their regular menu. Yesterday we delivered a huge array of produce for Peter McKloskey to work with. Five kinds of tomatoes, Poblano, Anaheim and Serrano peppers. Red Torpedo Onions from Italy, Cucumbers, those great Galia Melons and of course flowers for the dining room. I know that he is going to stuff some of the Poblanos and I wouldn’t be surprised to see the Melon for dessert. Every summer we threaten to have an on farm open house and dinner during tomato season but never seem to be able to get around to it (I wonder why? ), this is the next best thing and we don’t have to do the cooking! Come on out and enjoy the produce of the season. 5:30 to 9:00, no reservations necessary. Betsy and I will be there eating too (are you kidding, our food and we don’t have to prepare it!). Otherwise it is business as usual on the farm. Tomato picking twice a week, peppers once a week, with plenty of maintenance in between. 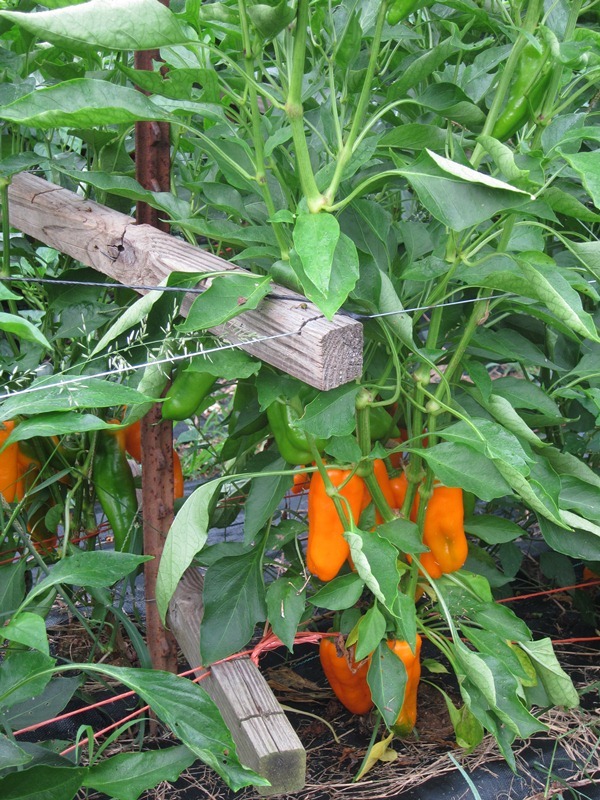 Tying up tomatoes and peppers, fighting back the encroaching weeds, mowing, mowing, mowing. Betsy is of course cutting flowers everyday. It is kind of like the steady buzz of the crickets at night, it just goes on and on. 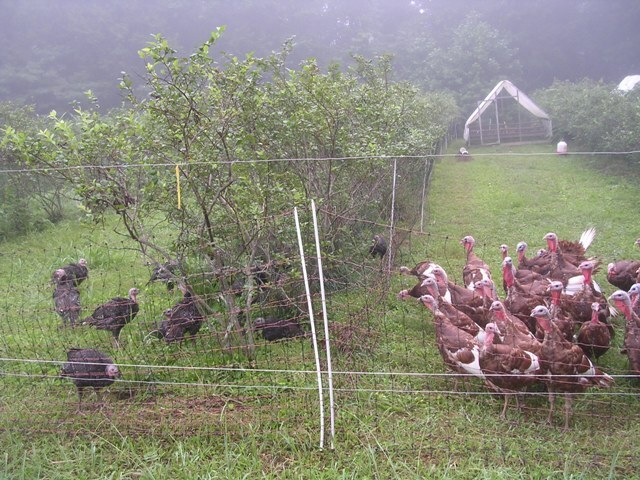 The turkeys are all now in the Blueberries, divided by a section of fence. This is the “get acquainted” period where they can talk to each other through the fence but the bigger birds can’t pick on the little (and strange to them) ones. In another 10 days or so they will all run together and it will be like old home week, by then they will just think of each other as cousins they haven’t seen for a year but will feel comfortable hanging around with!